Descriptions of marine mammals in the Croatian part of the Adriatic Sea date from as long ago as the 16th century. The first mention of the Mediterranean monk seal in the written Croatian language is to be found in a poem by Mavro Vetranovic Cavcic, 1482-1576, (Vetranovic Cavcic, 1871), who described Mediterranean monk seals on the small island of Sveti Andrija (Fig. 1), near Dubrovnik. The first formal mention of the dolphin appeared in 1595 in a dictionary compiled by Faust Vrancic (1595). However, the first scientific descriptions of cetaceans in Croatian Adriatic waters date from the end of the 19th century (Kolombatovic, 1885; Brusina, 1889). The following cetacean species in Croatian waters have been found and described: common dolphin - Delphinus delphis Linnaeus, 1758; bottlenose dolphin - Tursiops truncatus (Montagu, 1821); Risso's dolphin - Grampus griseus (Cuvier, 1812); harbour porpoise - Phocoena phocoena (Linnaeus, 1758); northern bottlenose whale - Hyperoodon ampullatus (Forster, 1770); long-finned pilot whale - Globicephala melas (Traill, 1809); false killer whale - Pseudorca crassidens (Owen, 1846); sperm whale - Physeter catodon Linnaeus, 1758; fin whale - Balaenoptera physalus (Linnaeus, 1758); minke whale - Balaenoptera acutorostrata Lacépčde, 1804; northern right whale - Eubalaena glacialis (Müller, 1776) (Hirtz, 1922, 1937, 1940; Fink, 1937; Riedel, 1963; Nishiwaki, 1972; Garms and Borm, 1981; Gomercic and Huber, 1989; Notarbartolo di Sciara and Bearzi, 1992; Gomercic et al., 1998), and, in October 1991, striped dolphin - Stenella coeruleoalba (Meyen, 1833) (Gomercic et al., 1994a). 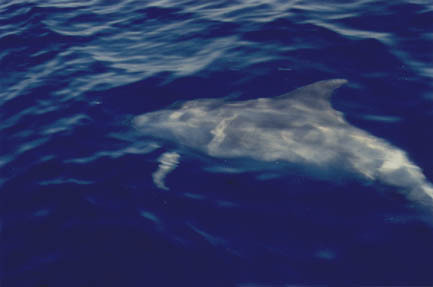 Cuvier's beaked whale - Ziphius cavirostris Cuvier 1823 - has also been found in Italian Adriatic waters (Notarbartolo di Sciara et al., 1994). In addition to the foregoing published data, sightings of the sperm whale, long-finned pilot whale, common dolphin, and bottlenose dolphin in Croatian waters, and striped dolphin in the outer limits of Croatian territorial waters, were noted between 1972 and 1992 (Beaubrun, 1995). Among these, the only true residents were common and bottlenose dolphins (Gomercic et al., 1998). Prior to the Second World War the common dolphin was prevalent, but today only the bottlenose dolphin (Figs. 2, 3, 4, 5) lives in the Adriatic Sea, while other species of cetaceans strayed into the Adriatic Sea only temporarily (Gomercic and Huber, 1989; Bearzi and Notarbartolo di Sciara, 1995; Gomercic et al., 1998; Bearzi et al., 1998). All species of cetaceans have been protected by Croatian law since 17 May 1995. The size of the bottlenose dolphin population in the Adriatic Sea is unknown. In fact, no data exists on the actual number, abundance and seasonal distribution of this, the only residential species of dolphin, in the Croatian part of the Adriatic Sea (Beaubrun, 1995). The only numerical data on the number of bottlenose dolphins in this part of the Adriatic Sea concern 106 individuals photo-identified during the period 1990-1994 in the Kvarneric area of the northern part of the Croatian Adriatic (Bearzi and Notarbartolo di Sciara, 1995). Additional data revealed one to four deceased, stranded dolphins each year in the period 1990-1997 (Gomercic et al., 1998). A very rough population estimate (1993) speculated a figure of some 150-300 individual bottlenose dolphins in the Croatian part of the Adriatic Sea (Gomercic et al., 1994). Fig. 1. The small island of Sveti Andrija where, for the first time (in XV/XVI century), the Mediterranean monk seal was described in the Croatian language. In the background is the city of Dubrovnik. The main aim of the study was to present the first census-based estimate of the population (total number) of bottlenose dolphins in the Croatian part of the Adriatic Sea in winter. Additionally, we studied the size and composition of dolphin schools, the number of cubs, and their spatial distribution in December. Recordings of any other species of cetaceans and of other sea mammals were also anticipated. The research team was recruited from the Faculty of Veterinary Medicine, University of Zagreb, Zagreb, Croatia. Aircraft pilots were members of the "Krila Kvarnera" Aeroclub, Rijeka, Croatia. In each of the four aircraft used there was at least one trained member of the research team, as well as a skilled pilot with experience in observation of the sea surface and the islands. The research team members were Prof. Dr. Hrvoje Gomercic DVM, Prof. Dr. Duro Huber DVM, Assistant Professor Dr. Damir Mihelic DVM, Hrvoje Lucic DVM, Tomislav Gomercic DVM student, and Martina Duras DVM student. The pilots were Andrej Bagar, Anton Micetic, Zoran Premus, and Josip Zezelic (Figs. 6, 7). pilot Zoran Premus, Prof. Dr. Duro Huber, and Prof. Dr. Hrvoje Gomercic. Fig. 7. 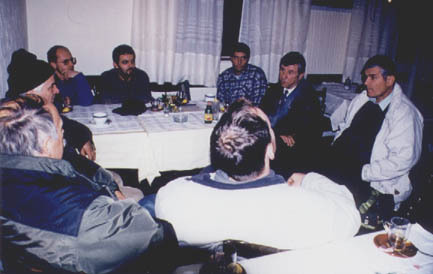 Part of the research team and pilots in the restaurant at Grobnik Airport in the evening, after landing. 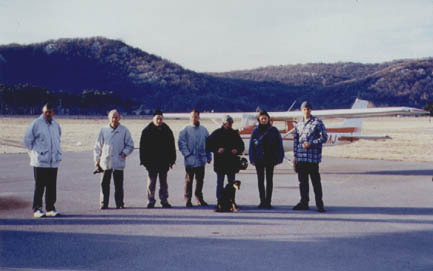 From right to left: Prof. Dr. Hrvoje Gomercic, pilot Anton Micetic, Tomislav Gomercic, DVM student, Hrvoje Lucic, DVM, Assistant Professor Dr. Damir Mihelic, pilot Zoran Premus; from the back, pilots Josip Zezelic and Andrej Bagar. A crew-training flight was performed in order to obtain experience and to standardise methods of work. In the preliminary study we used two single-engine high-wing monoplanes: a Cessna 172, Registered Number 9A DDH (H. Gomercic, D. Huber, H. Lucic, and pilot A. Micetic), and a Citabria CH-10, Registered Number 9A CAF (T. Gomercic, and pilot A. Bagar). The aircraft were in permanent radio contact one with another and with aircraft control centres in Rijeka and Pula. They were provided with Global Positioning System (GPS): Garmin GPS 12 XL Personal Navigator for exact positioning of dolphin schools and positioning of aircraft. A preliminary flight took place on 13 December 1998, between 12.18h and 16.04h in the Northern Adriatic Sea (Gulf of Rijeka, Kvarneric, and Kvarner). Weather conditions were: wind speed 0-7 km/h; wave height 0-10 cm; horizontal visibility 20-30 km; 3/4 cloudy sky; seawater temperature 14-15 oC; air temperature 7-11 oC (Fig. 8). Flight speed of the Citabria CH-10 was c. 150 km/h, and of the Cessna 172 c. 200 km/h. Flight altitude was between 50 and 500 m.
The aircraft made three to six passes over the dolphin groups found in order to allow the researchers and pilot to count the number of animals and to assess the composition of the dolphin school. In this study, Citabria CH-10 found three dolphin schools (P1, P2, P3). P1 and P2 were in Kvarneric between the islands of Rab and Cres. School P3 was in Kvarner between the Istrian Peninsula and the island of Cres (Fig. 9). 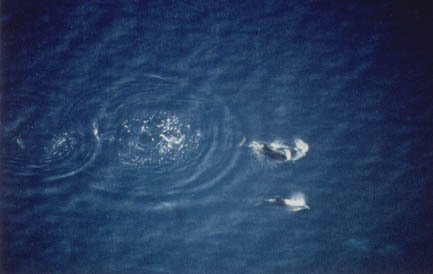 According to the findings of a team member in the Citabria CH-10, the P1 school comprised two dolphins, P2 of one dolphin, and P3 of two dolphins. Between 5 and 13 minutes later the second aircraft (Cessna 172) arrived at the same positions (P1, P2 and P3). 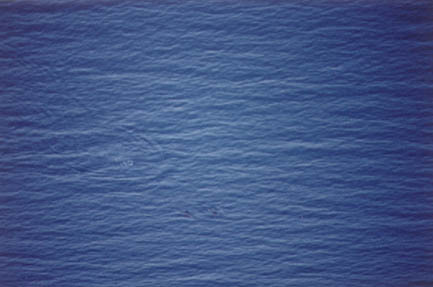 The researchers in this aircraft found two dolphins at site P1, zero dolphins at position P2, and six dolphins (including one cub) at position P3. 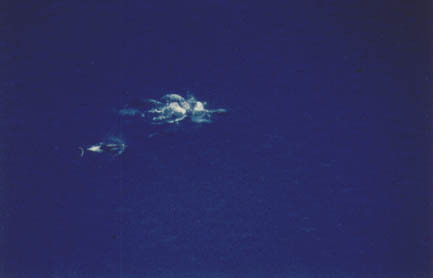 According to the results of the preliminary study it was verified that the best results of an aerial survey of dolphins (under these weather conditions in the Adriatic Sea and at an airspeed of 150-200 km/h) were to be obtained from an altitude of 200 m. This agrees with the findings of many authors (Ross et al., 1989; Cockroft and Peddemors, 1990; Yoshida et al., 1997, 1998; Carretta et al., 1998; Forney and Barlow, 1998; Würsig et al., 1998). Under such weather conditions and at an altitude of 200-m, the estimated visible search strip (trackline - flight path) was 4 km (2 km on either side of the aircraft). Fig. 8. 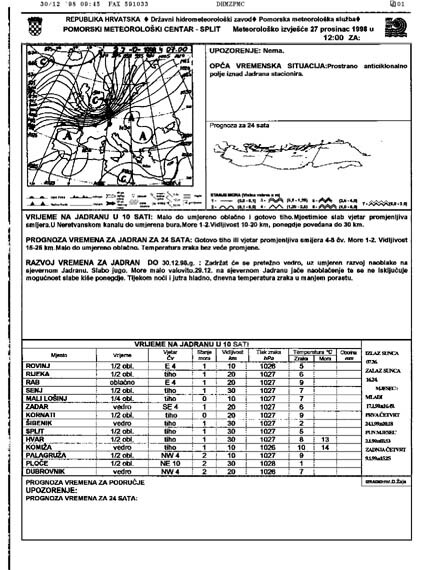 Fax from the Naval Meteorological Centre (State Hydrometeorological Department), Split, Croatia, containing weather conditions on 13 December 1998. Fig. 9. 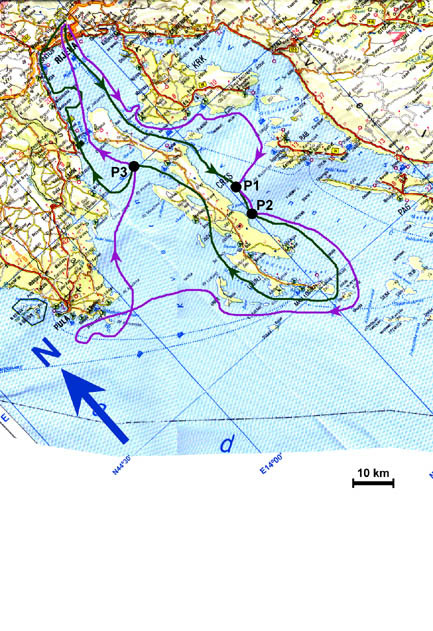 Map of the northern part of the Croatian Adriatic Sea (Gulf of Rijeka, Kvarneric, and Kvarner) showing courses of aircraft Citabria CH-10 (green line), and Cessna 172 (violet line) during tandem preliminary study on 13 December 1998, with positions (P1, P2, and P3) of sighted dolphin schools. The most probable actual number of dolphins at the three mentioned sites was nine specimens (P1=2 dolphins, P2=1 dolphin and P3=6 dolphins). However, at these locations the first aircraft found only five dolphins (56%) while the second aircraft found eight dolphins (89%) of the nine actually present. We conclude that under the above described weather conditions, and at an airspeed of 150-200 km/h, we were able to see only about 56-89% of dolphins within the surveying track. This means that the census of each individual survey flight must be positively corrected by 12-80% (average 46%). This is in agreement with the conclusion of Carretta et al. 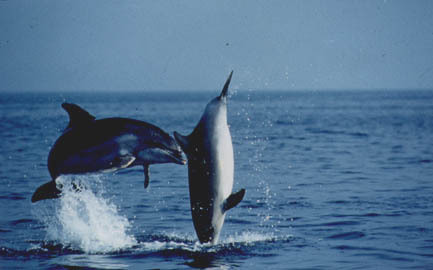 (1998), in that abundance estimates from tandem survey averaged 53% higher than dolphin counts obtained from individual survey flights. Aerial surveys of dolphins in the Croatian part of the Adriatic Sea were performed on 27 December 1998. Sunrise was at 7.26, and sunset was at 16.24, according to standard time (Central European Time = 1 hour plus Greenwich Mean Time). During the several previous days we received Meteorological Reports, together with a weather prognosis, telefaxed twice-daily (at 6 and 12 hours) from the Adriatic Sea Naval Meteorological Centre (State Hydrometeorological Department), Split, Croatia. We used four single-engine high-wing monoplanes (Figs. 10, 11, 12): Cessna 172, Registered Number 9A DDH (flight and aircraft A), Citabria CH-10, Registered Number 9A CAF (flight and aircraft B), Cessna 150, Registered Number 9A DAH (flight and aircraft C) and Cessna 150, Registered Number 9A DAJ (flight and aircraft D) simultaneously. All aircraft were provided with Global Positioning System (GPS): Garmin GPS 12 XL Personal Navigator with Remote Antenna for exact positioning and timing of dolphin schools and for aircraft positioning. Binoculars, naval maps and 35-mm still cameras were also used. For the planning of tracklines (flight paths) for each of the four aircraft, and for pooling, processing and mapping of data from all aircraft, we used PC (Pentium) (Figs. 14, 15) and FUGAWI Moving Map Software for GPS Receivers, Version: 2,18 (1998), and naval maps 1:100,000 (STATE HYDROGRAPHIC INSTITUTE, 1996). Data for this Report were calculated by Fugawi Software (1998) and on the basis of the "Autokarta Hrvatske 1:500,000" map (Birin and Stefanac, 1997). All positions of aircraft and dolphin schools were recorded by GPS equipment in degrees, minutes, seconds and tenths of seconds of northern latitude and eastern longitude. However, in this Report all measured positions are presented to the nearest degree and minute. Fig. 10. Aircraft used at Airport Grobnik, in the morning, before take-off. From right to left: Cessna 172, Cessna 150, Cessna 150 and Citabria CH-10. Fig. 11. 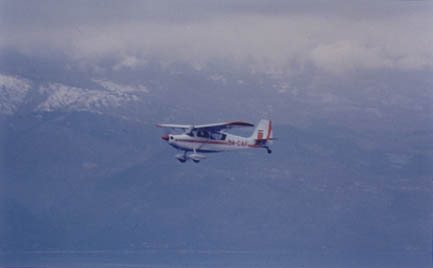 Citabria CH-10 above the Gulf of Rijeka, with Mount Ucka in the background. Fig. 12. 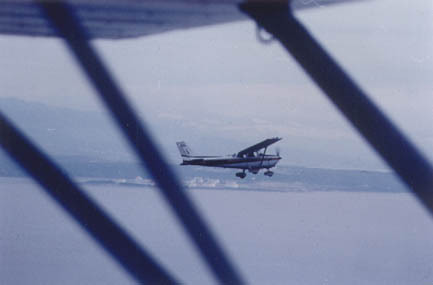 Cessna 172 above the Gulf of Rijeka, with the island of Krk and tanker terminal in the background. Fig. 13. 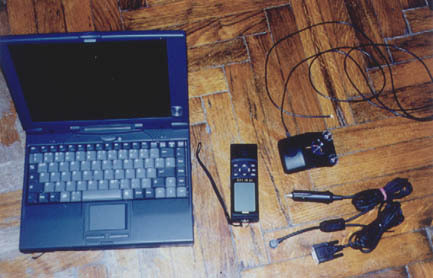 Equipment used for navigation, Garmin GPS 12 XL Personal Navigator with remote Antenna, PC Interface Cable with Cigarette Lighter Adapter and PC Pentium. Fig. 14. 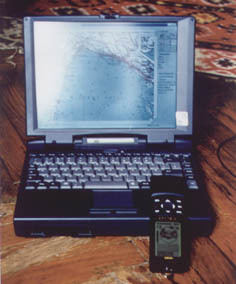 Garmin GPS 12 XL Personal Navigator and PC Pentium with displayed map of the Gulf of Rijeka in FUGAWI Moving Map Software. Fig. 15. Transferring data from GPS equipment to PC Pentium at Grobnik Airport after the flight. Fig. 16. 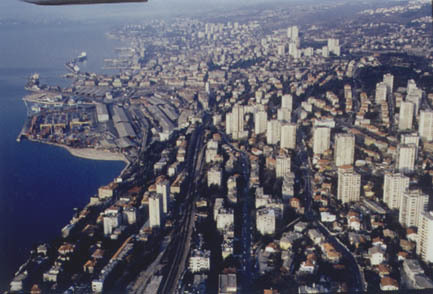 Rijeka, Croatia's largest harbour, near Grobnik Airport. Fig. 17. 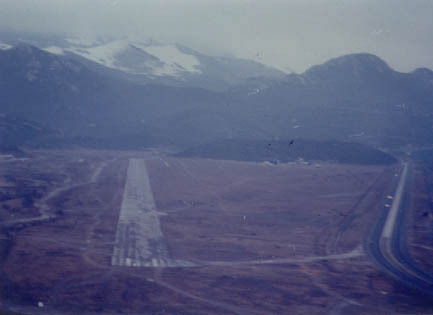 Landing at Grobnik Airport, near Rijeka. Fig. 18. Landing at Resnik Airport, near Split. Fig. 19. 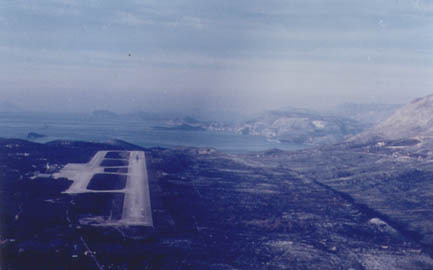 Landing at Cilipi Airport, with Dubrovnik in the background. Aircraft A was provided with a Canon EOS 5000 and an AF Canon Zoom 80-200 mm; aircraft B was provided with a Nikon N50 and an AF Zooms 28-80 and 70-310; aircraft C was provided with a Minolta DYNAX 500si and an AF Sigma Zoom 100-300 mm, and aircraft D was provided with a Minolta X-700 and a Quantary Zoom 70-210 mm. For photodocumentation we used Kodak Select Elite Chrome EB ISO 100/21o, and 400/27o film for colour slides. Slides were copied on Kodak Gold GB ISO 200/24o film for prints. All researchers and pilots counted the dolphins in every dolphin school, with the highest confirmed number of dolphins in each school being recorded. Those dolphins that were smaller by about one-third of their body length were recorded as cubs. All aircraft initially took off from Grobnik airport, near Rijeka, ultimately returning to Grobnik but landing for refuelling at airports at Zadar (D), Split (C) and Dubrovnik (A and B). During flights the aircraft were in radio contact with aircraft control centres in Rijeka, Pula, Zadar, Split and Dubrovnik. 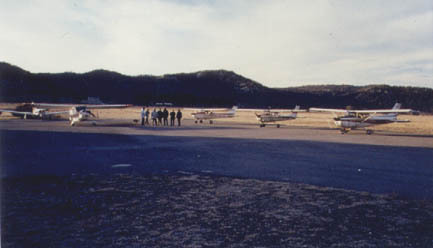 All aircraft flew pre-programmed courses. All courses were planned with a minimum overlap of each other. The recorded sortie lengths (in km) of each aircraft were exclusive of 3-6 passes over every dolphin school. In the event of the discovery of any sea mammal other than a bottlenose dolphin, the working protocol was to instruct the nearest aircraft to detour from its own pre-planned flight path and to assist in consulting and in confirming the species. In addition to the pilot (Anton Micetic), a team of three observers (Hrvoje Gomercic, Damir Mihelic, and Martina Duras) were present on flight A. In addition to the pilot (Andrej Bagar), one observer (Duro Huber) was present on flight B. In addition to the pilot (Josip Zezelic), one observer (Tomislav Gomercic) was present on flight C.
In addition to the pilot (Zoran Premus), one observer (Hrvoje Lucic) was present on flight D.
The Republic of Croatia has a total of surface area of 88,198 km2, including 31,660 km2 of sea surface area. The outer limits of Croatian territorial waters are 12 nautical miles from the Croatian coastline, islands or islets. Croatian territorial waters lie between N42o South and N45o34' North. The longest stretch of Croatia's international boundary at sea merges with the international waters of the Adriatic Sea, while northward it measures 16 km adjacent to the Republic of Slovenia, and 25 km adjacent to the Italian Republic. In the Mali Ston Channel (Fig. 20) in the neighbourhood of the town of Neum, there is an international sea boundary extending for 12 km adjacent to Bosnia-Herzegovina, and in the south a 27-km international sea boundary adjacent to Montenegro. Total coastline length is 5,790 km, of which 1,185 islands and islets (total surface area of 3,271 km2) account for 4,012 km of that figure, 1,778 km being continental coastline. Sixty-six of the islands are inhabited. In Croatian internal waters there are three National Parks: the Brijuni Archipelago - 36 km2 (Fig. 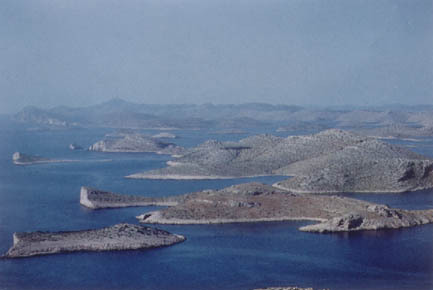 21); the Kornati Archipelago - 224 km2 (Fig. 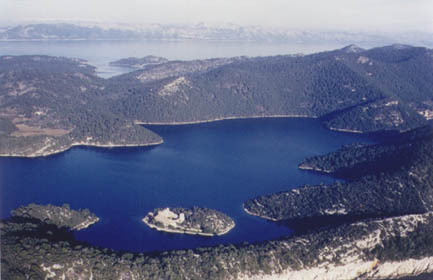 22), and Mljet Island - 31 km2 (Fig. 23). 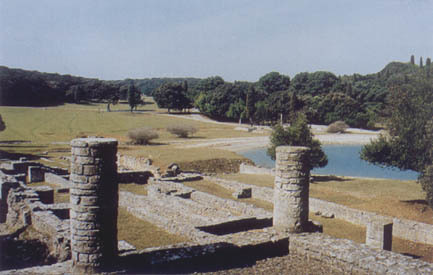 There is also one Nature Park: the Bay of Telascica (Fig. 24), on the island of Dugi Otok. Immediately abutting the sea lies the Mount Velebit Nature Park and UNESCO Biosphere Reserve: Mount Velebit - 2,274 km2 (Figs. 25, 35, 36), the Paklenica National Park- 36 km2 (Fig. 25) and, near the town of Sibenik, the Krka National Park - 142 km2. All islands and islets have a very similar geological structure, being composed essentially of limestone rocks, except for the island of Susak (Fig. 26) which is composed essentially of sedimentary river sand, and the two volcanic islets of Jabuka (Figs. 27, 28) and Brusnik (Fig. 29). The depth of the Croatian part of the Adriatic Sea increases gradually from north to south. The shallowest area (20-30 m) is at the extreme northern end, along the western coast of the Istrian Peninsula, and the Gulf of Rijeka (50-60 m). In the south, depths are somewhat greater, but in general are less than 100 m, except around the island of Jabuka (250 m) and in the extreme south (up to 400 m). The sea bottom of this area is essentially sandy and muddy, although in some places it is gravelled and rocky. Fig. 20. 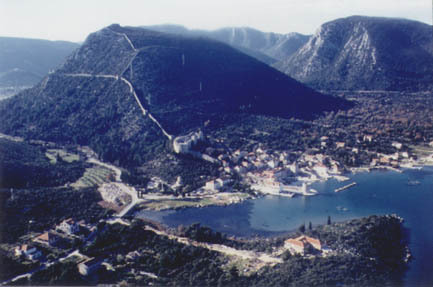 The ancient Croatian town of Mali Ston, near the end of the Mali Ston Channel. Fig. 21. Brijuni Archipelago National Park (Photo: I. Bralic). Fig. 22. 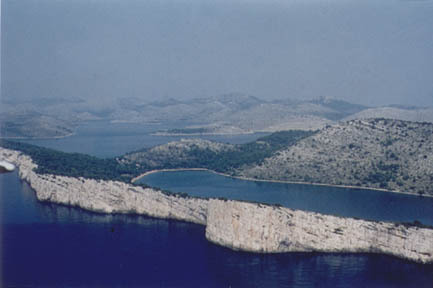 Kornati Archipelago National Park (Photo: S. Strikoman). Fig. 23. Mljet Island National Park, with Benedictine monastery dating from the XII century, located on a small island in Veliko jezero. Fig. 24. Telascica Bay Nature Park, with the saltwater Mir Lake, 1982 (Photo: H. Gomercic). Fig. 25. 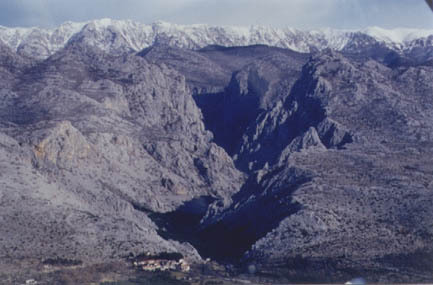 Paklenica National Park on Mount Velebit, near the Adriatic Sea. Water temperature of the Adriatic Sea is between 12 oC in February and 27 oC in August. The main sea streams through this area flow northwards from the Ionian Sea. Four hundred and seven species of fish have been recorded as living in the Adriatic Sea (Soljan, 1965; Jardas, 1996) and eight species of cephalopods (Basioli, 1978; Grubisic, 1990). Many of these are possible dolphin prey. For the purposes of this study, Croatian territorial waters were divided into inshore and offshore waters (Fig. 30). Inshore waters have a surface area of 15,254 km2, and offshore waters a surface area of 16,406 km2. Inshore waters include all Croatian islands and islets except the islands of Jabuka - N43o16'; E15o27'13'' (Figs. 27, 28), Svetac - N43o02'; E15o45' (Fig. 45), Brusnik - N43o00'40''; E15o48' (Fig. 29), Susac - N42o46'; E16o31', Palagruza - N42o23'40''; E16o16' (Fig. 46) and their islets, and the islet of Galijula - N42o22'53''; E16o19'58'' (Fig. 47). 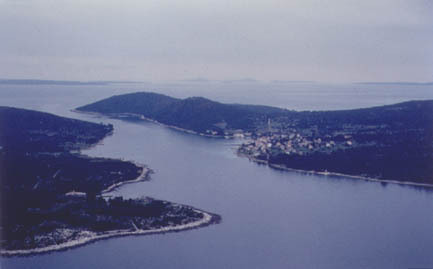 Inshore waters correspond to Croatian internal sea waters, although their boundary is some 5 km offshore (from the boundary of internal sea waters and of the continental coast, or of the outer coastline of offshore islands and islets, except for Jabuka, Svetac, Brusnik, Susac, Palagruza and Galijula). Fig. 26. 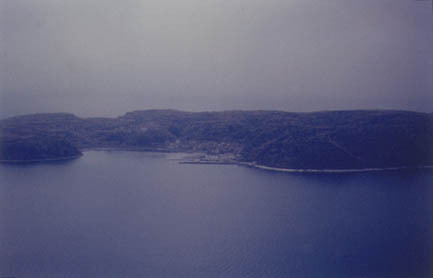 Island of Susak, composed essentially of sedimentary river sand. Fig. 27. 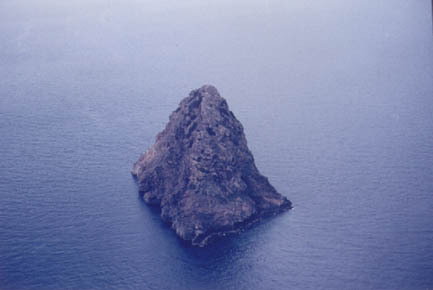 The volcanic islet of Jabuka. Fig. 28. 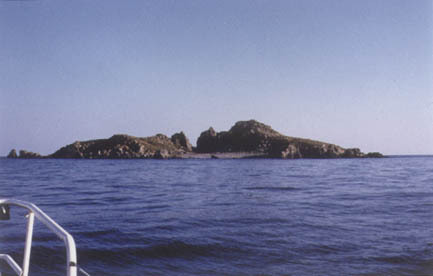 The volcanic islet of Jabuka. Fig. 29. The volcanic island of Brusnik (Photo: H. Gomercic). Aerial surveys of dolphins in the Croatian part of the Adriatic Sea were carried out on 27 December 1998. Weather conditions at 10 a.m. in the Croatian part of the Adriatic Sea were, on average, semi-cloud cover; wind speed, 0 km/h in most places, and in others up to 7 km/h; wave height in the range 0-10 (locally up to 25) cm; horizontal visibility 10-30 km; atmospheric pressure 1,026-1,028 hPa; air temperature 5-10 oC; sea temperature 13-14 oC (Fig. 31). Aircraft A took off at 9.09 from Grobnik Airport and flew a pre-programmed course (violet line on Figs. 32, 33a, b, c, d and e). At 9.45 and at position N44o38'28.9''; E14o10'22.9'' it recorded dolphin school A1, and at 10.25 dolphin school A2 (Fig. 37) at position N43o57'48.5''; E14o46'41.1''. School A1 comprised two, and school A2 five, adult bottlenose dolphins. This aircraft flew a distance of 702.6 km until, at 13.15, it landed at Dubrovnik Airport in Cilipi. It took off again at 14.48. During the second leg of its flight, at 15.52 and at position N43o54'29.7''; E15o05'12.0'' it recorded dolphin school A3; at 16.05 and at position N44o05'56.0''; E14o52'51.4'' school A4; at 16.13 and at position N44o11'55.0''; E14o43'00.9'', school A5, and at 16.29 and at position N44o31'07.6''; E14o22'47.1'', school A6. School A3 comprised two adult dolphins, A4 nine adults, A5 four adults, and A6 three adult dolphins and two cubs (Fig. 30). This aircraft flew a distance of 538.5 km on the second leg of its flight. At 17.05 it landed at the base airport of Grobnik. Altogether, it flew for 6.49 h and covered 1,241.1 km, 32.9 km of this overland and 1,208.2 km over the sea. Aircraft B took off at 9.17 from Grobnik Airport and flew a pre-programmed course (green line on Figs. 32, 33a, b, c, d and e). At 11.06 and at position N43o41'56.5''; E15o45'47.1'' it recorded dolphin school B1; at 11.17 dolphin school B2 at position N43o39'29.4''; E15o48'39.8'', and at 11.51 school B3 (Fig. 39) and at position N43o07'23.6''; E16o30'47.0''. School B1 comprised eleven, and school B3 six adult dolphins. School B2 comprised four adult dolphins and three cubs. This aircraft flew 571.4 km on its first leg, landing at 12.53 at Dubrovnik Airport in Cilipi. It took off again at 13.38. At 13.58 it recorded school B4 at position N42o45'08.0''; E17o43'54.3''; at 15.18 school B5 at position N43o40'28.2''; E15o35'25.1''; at 15.20 school B6 at position N43o41'36.5''; E15o33'55.0''; at 15.51 school B7 at position N44o16'35.3''; E14o52'06.9'', and at 16.04 school B8 at position N44o30'58.2''; E14o43'50.8''. School B4 comprised five adult dolphins and one cub; dolphin schools B5 comprised four, B6 six, B7 two, and B8 nine, adult bottlenose dolphins (Fig. 30). This aircraft flew 486.9 km on its return flight and landed at the base airport of Grobnik at 16.40. Altogether, it flew for 6.38 h and covered 1,058.3 km, 24.6 km of this overland and 1,033.7 km over the sea. Fig. 30. Map of the inshore (15,254 km2) and offshore (16,406 km2) waters of the Croatian part of the Adriatic Sea (Croatian territorial waters - 31,660 km2), with sighted bottlenose dolphin schools on 27 December 1998. Small map: Position of Croatia (black) in Europe. Fig. 31. 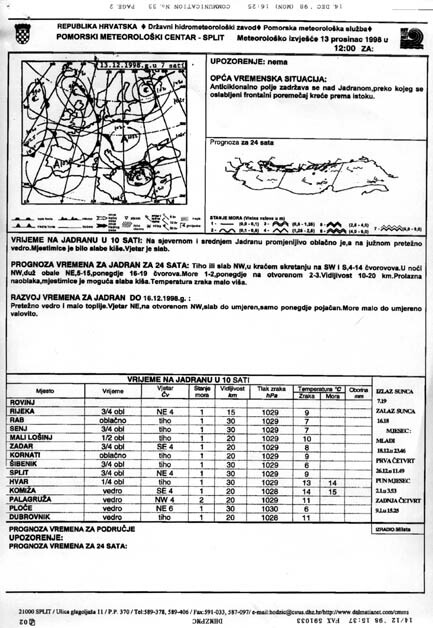 Fax from the Naval Meteorological Centre (State Hydrometeorological Department), Split, Croatia, showing weather conditions on 27 December 1998 at 10.00. Fig. 32. Map of the Croatian part of the Adriatic Sea, showing aircraft courses: aircraft A (violet line), B (green line), C (red line) and D (blue line). Fig. 33a. Map of the northern part of the Croatian part of the Adriatic Sea with shaded search strip (trackline - flight path) of aircraft A in violet, B in green, C in red, and D in blue, with position of sighted school of bottlenose dolphins. Fig. 33b. Map of part of the Croatian part of the Adriatic Sea with shaded search strip (trackline - flight path) of aircraft A in violet, B in green, C in red, and D in blue, with positions of sighted school of bottlenose dolphins. Fig. 33c. Map of part of the Croatian part of the Adriatic Sea with shaded search strip (trackline - flight path) of aircraft A in violet, B in green, C in red, and D in blue, with positions of sighted school of bottlenose dolphins. Fig. 33d. Map of part of the Croatian part of the Adriatic Sea with shaded search strip (trackline - flight path) of aircraft A in violet, B in green, and C in red, with positions of sighted school of bottlenose dolphins. Fig. 33e. Map of the southern area of the Croatian part of the Adriatic Sea with shaded search strip (trackline - flight path) of aircraft A in violet, and aircraft B in green, with positions of sighted school of bottlenose dolphins. Fig. 34. 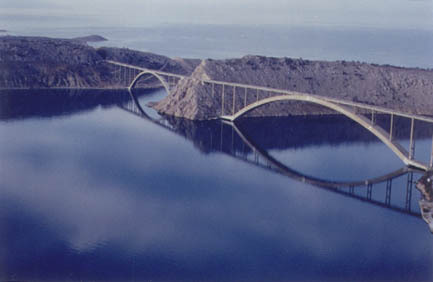 The bridge to Krk Island, on 27 December 1998 at 9.33 a.m. Fig. 35. 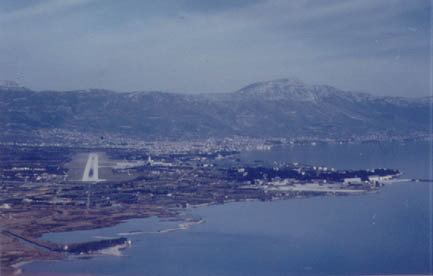 The new Maslenica bridge on 27 December 1998 at 10.56 a.m., with the Mount Velebit Nature Park and UNESCO Biosphere Reserve in the background. Before the bridge, the ruin of the former bridge, destroyed by Yugoslav Army units in 21 November 1991. Fig. 36. 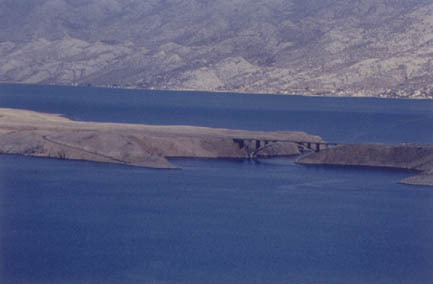 The bridge to Pag Island on 27 December 1998 at 11.08 a.m., with the Mount Velebit Nature Park and UNESCO Biosphere Reserve in the background. The environs of this bridge are the last known habitat of two specimens of Mediterranean monk seal, before the bridge was bombed and rocketed by Yugoslav Army units in 1992. Fig. 37. Some dolphins of dolphin school A2. Fig. 38. Some dolphins of dolphin school B1. Fig. 39. Some dolphins of dolphin school B3. Fig. 40. Some dolphins of dolphin school C1. Fig. 41. A dolphin of dolphin school D1. Aircraft C took off at 9.22 from Grobnik Airport and flew a pre-programmed course (red line on Figs. 32, 33a, b, c and d). At 11.30 and at position N44o13'10.3''; E15o06'36.8'' it recorded dolphin school C1 (Fig. 40). This school comprised six adult dolphins and one cub. This aircraft flew 432,5 km until 12.28, when it landed at Split Airport Resnik, near Trogir. It took off again at 13.31 and at 15.48 it recorded dolphin school C2 at position N44o33'36.4''; E14o46'39.6''. This school comprised four adult dolphins (Fig. 30). The aircraft flew 431.9 km on its return flight and landed at the base airport of Grobnik At 16.32. Altogether, it flew for 6.07 h and covered 864.4 km, 21.0 km of this overland and 843.4 km over the sea. Aircraft D took off at 9.18 from Grobnik Airport and flew a pre-programmed course (blue line on Figs. 32, 33a, b, c). At 10.30 and at position N45o10'54.9''; E13o33'37.9'' it recorded dolphin school D1 (Fig. 41). This was a single adult dolphin. The aircraft flew 455,2 km until 12.42, when it landed at Zadar Airport in Zemunik. It took off again at 13.07 and at 13.57 it recorded dolphin school D2 at position N43o39'27.1''; E15o37'06.3''. This school comprised six adult dolphins and one cub (Fig. 30). The aircraft flew 382.2 km on its return flight and landed at the base airport of Grobnik At 16.20. Altogether, it flew for 6.37 h and covered 837.4 km, 32.3 km of this overland and 805.1 km over the sea. The summarised data of sighted bottlenose dolphin schools on 27 December 1998 are presented in Table 1 and in Figs. 30, 32, 33a, b, c, d, e.
All four aircraft were in the air for a total of 26 hours and 11 minutes and travelled 4,001.2 km, 110.8 km of this overland and 3,890.4 km over the sea. As the search strip (trackline - flight path) was four km wide (two kilometres either side of the aircraft), all four aircraft surveyed a total of 15,561.6 km2 of the Croatian part of the Adriatic Sea. However, as the search strips intersected at a number of places (violet, green, red, and blue shaded search strips in Figs. 33a, b, c, e) the actual total surveyed surface was only 14,507.4 km2, or 1,054.2 km2 less than the absolute total. Average time of aircraft passes over dolphin schools (3-6 passing rounds) for each of 18 groups was 3 minutes and 46 seconds (minimum 2 and maximum 14 minutes). * Distance between C2 and B8 was 6.1 km, and time difference was 16 minutes; swimming speed should have been 22.6 km/h, and group sizes were more than double. These are the reasons why we are certain that C2 and B8 were two different dolphin schools. Although numerous cetacean species - common dolphin, bottlenose dolphin, striped dolphin, Risso's dolphin, harbour porpoise, northern bottlenose whale, long-finned pilot whale, false killer whale, sperm whale, fin whale, minke whale, northern right whale, Cuvier's beaked whale (Hirtz, 1922, 1937, 1940; Fink, 1937; Riedel, 1963; Nishiwaki, 1972; Garms and Borm, 1981; Gomercic and Huber, 1989; Notarbartolo di Sciara and Bearzi, 1992; Gomercic et al., 1994a; Notarbartolo di Sciara et al., 1994; Gomercic et al., 1998) have been found and described in the Adriatic Sea, on 27 December 1998 between 9 a.m. and 5 p.m. we saw only bottlenose dolphins on the surveyed surface, i.e., 45.8% of the Croatian part of the Adriatic Sea. During that period we saw no other species of marine mammal. This tends to confirm that today, only the bottlenose dolphin is resident in the Adriatic Sea (Gomercic and Huber, 1989; Bearzi and Notarbartolo di Sciara, 1995; Bearzi et al., 1998; Gomercic et al., 1998). In a study of the abundance of dolphins there are two factors used for determination of group resightings (Carretta et al, 1998). Dolphin schools are unique (not resighted - or not recaptured, according to Carretta et al., 1998) if the distance between them would have required the group to exceed an assumed maximum group travel speed of 3.5 km/h (between 1 and 6 km/h) (Cockcroft et al., 1992; Mate et al., 1995). Average group travel speed is 3.5 km/h for the coastal bottlenose dolphins of South Africa (Cockcroft et al., 1992). The second factor in the determination of school resightings is the observed group size. If the sizes of twice sighted schools (at the same place - or sufficiently close to the same place) at different times are less than double it can be considered a resighted group. However, if the sizes are more than double, the groups are not counted as resighted. According to these criteria (criteria for discrimination of potentially resighted schools) of our 18 sighted dolphin schools - schools A2 and B5 - were resighted (Table 1). For this reason, schools A2 and B5 were not taken into consideration for further calculations. Hence, on 27 December 1998 in the Croatian part of the Adriatic Sea, we saw 16 different bottlenose dolphin schools comprising a total number of 80 different adult dolphins and 8 different cubs. Carretta et al. 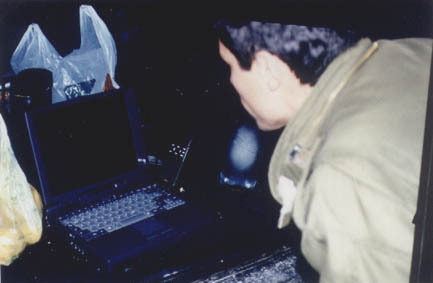 (1998) demonstrated by using mark-recapture analysis that bottlenose dolphin counts obtained from individual survey flights must be corrected by plus 53%, which was the result of the tandem aerial surveys method. There was a close similarity in our study, where two schools were sighted twice in a tandem survey (term by Carretta et al., 1998). In school A2, five dolphins were counted during the first aircraft pass, but 5 hours and 40 minutes later nine dolphins were counted in school A4 (probably the same school as school A2). School B5 comprised four dolphins, but 1 hour and 21 minutes earlier school D2 (probably the same school as school B5) comprised seven dolphins. This means that in tandem surveys school A2/A4 was 80% higher than the dolphin count obtained from the individual survey flight, and tandem surveys of school B5/D2 showed a 75% higher figure than the dolphin count obtained from individual survey flights. On the basis of our preliminary study and tandem surveys of schools A2/A4 and B5/D2, it is clear that abundance estimates from tandem surveys averaged 61.8% higher than dolphin counts obtained from individual survey flights. According to Carretta et al. (1998) this is, on average, 53% higher. Due to the fact that our method of aerial survey (flight at an altitude of almost 200 m and at an averaged airspeed of 158 km/h) of dolphin number estimation is very similar to the methods of Carretta et al. (1998) - flying at an altitude of 213 m and at an airspeed of 185 km/h - we accept that counts obtained from individual survey flights must be increased by only 53% to achieve an exact number of dolphins on the surveyed sea surface. Fig. 42. The islands of Ilovik (right) and Sv. Petar (left) at the junction of Kvarneric and Kvarner. In the background (left) is the island of Silba where a young fin whale (11 m long) was stranded in 1990. Fig. 43. 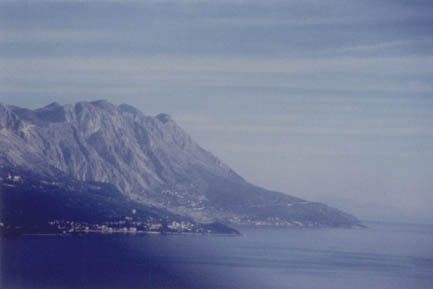 Mount Biokovo, in the southern part of the Croatian Adriatic coast, behind the Makarska Riviera. 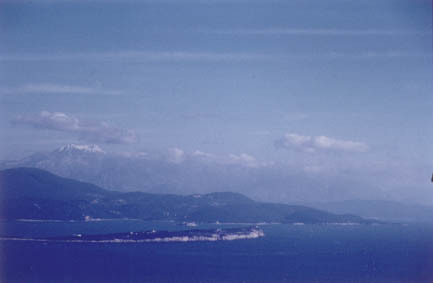 The Peljesac Peninsula can be seen in the background. Fig. 44. Komiza, a small town on the west coast of Vis Island, with numerous fishermen and a developed fishing industry. Fig. 45. 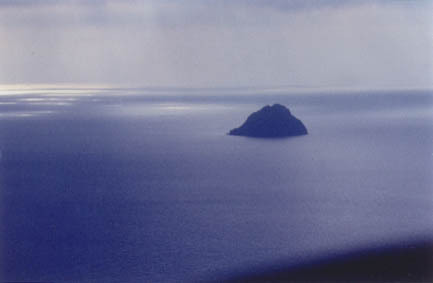 Svetac Island and Kamik islet, and the volcanic island of Brusnik in haze. There are many caves here once used by monk seals. Fig. 46. 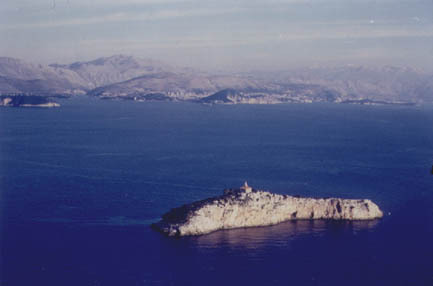 Palagruza Island, the most distant offshore Croatian island. 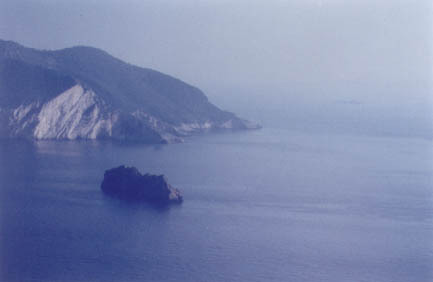 In spring and summer 1993 a specimen of Mediterranean monk seal was seen here. Fig. 47. 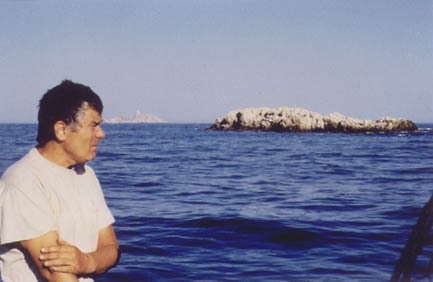 Galijula islet, the most southerly point of Croatian land, at N42o22'53; E16o19'58'' and Prof. Dr. Hrvoje Gomercic, the author of this Report. 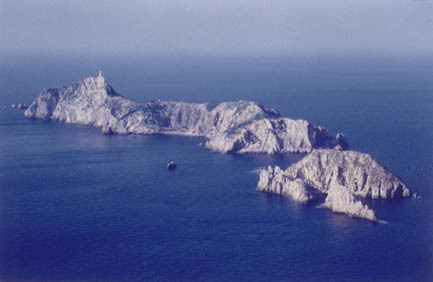 Palagruza Island can be seen in the background. (Photo: T. Gomercic). Fig. 48. The Prevlaka Peninsula, with Cape Ostra (N42o23'24'';E18o32'24''), the southernmost part of continental Croatia. 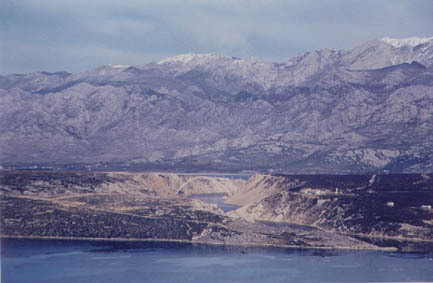 In the background is the entrance to Boka Kotorska Bay, and the Montenegrin coast, with Mount Lovcen (1,749 m) under snow. For calculating the total number of dolphins on the surveyed surface of the Adriatic Sea we totalled all our sighted dolphins, except for schools A2 and B5 (these were considered as resighted) and schools D2 and A4 (these were tandem aerial surveyed). The sum was 72 dolphins in 16 school plus 53%. This resulted in 110 dolphins in 24 schools plus D2 and A4 (these were tandem aerial surveyed), which amount to a total of 126 dolphins (including 12 cubs) in 26 schools. According to this calculation and our data (Table 1) we can conclude that on the surveyed surface of the Adriatic Sea (14,507.4 km2) there were 126 bottlenose dolphins, and that of this number 10% were cubs. Also, that they were grouped in 26 dolphin schools. The total surface area of the Croatian part of the Adriatic Sea is 31,660 km2. 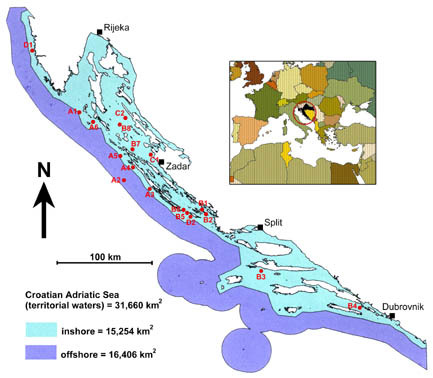 The aerially surveyed surface area of the Adriatic Sea was 45.8% of the total surface area of the Croatian Adriatic Sea. If we calculated the number of dolphins for the entire Croatian part of the Adriatic Sea, we would expect that in the whole Croatian part of the Adriatic Sea on 27 December 1998 there lived 57 bottlenose dolphin schools with 249 adult animals and 26 cubs (a total of 275 individuals). Average school size was 4.8. The surface area of inshore waters is 15,254 km2, and of offshore waters 16,406 km2. We defined all sea surface area over 5 km from the outermost major islands as offshore waters. The aerially surveyed surface area of inshore waters measured 11,752 km2 (77%), while the surveyed surface area of offshore waters measured 2,755 km2 (16.8%). All sighted dolphin schools were in inshore waters, except for school A2, which was in offshore waters 19.0 km from the nearest coastline of Dugi Otok island. In A2 school we sighted five adult dolphins, but 5 hours and 40 minutes later this school was found in inshore waters, recorded as A4 dolphin school (Table 1). The actual number in this school (A2/A4) was nine adult dolphins. According to the foregoing, we were able to calculate that the total number of dolphins in surveyed (77%) inshore waters was 114 adult bottlenose dolphins and 12 cubs in 26 dolphin schools, or 148 adults and 16 cubs in 34 bottlenose dolphin schools in the entire (100%) inshore waters. The actual total number of dolphins in the surveyed (16.8%) surface area of offshore waters was nine adult dolphins in one school, or, by calculation, 54 adult dolphins in 6 schools in the entire (100%) offshore waters. When calculating the number of dolphins in inshore and offshore waters separately, we can expect that in the whole of Croatian territorial waters on 27 December 1998 there lived 40 bottlenose dolphin schools, comprising 202 adult animals and 16 cubs (a total of 218 individuals). Average school size was 5.5. This estimated abundance is in accordance with our very rough population estimate made in 1993, in which it was speculated that some 150-300 individual bottlenose dolphins live in the Croatian part of the Adriatic Sea (Gomercic et al., 1994). One or more cubs were present in 31.3% of dolphin schools. The estimated abundance of bottlenose dolphins in the Croatian part of the Adriatic Sea is: in inshore waters 10.75/1,000 km2, and in offshore waters 3.3/1,000 km2. To conclude this Discussion, we stress that the size and composition of particular dolphin schools were not able to be precisely photo-documented. This was because it was not feasible to see all animals of the school at the same moment on the sea surface and on the same screen. On 27 December 1998 we saw 16 different bottlenose dolphin (Tursiops truncatus) schools comprising a total number of 80 different adult dolphins and 8 cubs in 45.8% of the total surface area of the Croatian part of the Adriatic Sea. From this data we calculated that on this surface area (14,507.4 km2) there were 114 adult bottlenose dolphins and 12 cubs in 26 dolphin schools. We calculate that in the whole of the Croatian part of the Adriatic Sea (31,660 km2) there were 40 bottlenose dolphin schools comprising a total of 218 specimens (202 adult animals and 16 cubs). In the winter period in question, dolphin cubs accounted for 10% of the population, while 31.3% of dolphin schools had one or more cubs that were smaller by about one-third of their body length compared to adults. Average school size was 5.5. Only one sighted bottlenose dolphin school was in offshore waters, 19.0 km from the nearest coast, but 5 hours and 40 minutes later this school was sighted in inshore waters. All other sighted bottlenose dolphin schools were in internal waters, or less than 5 km from the coast. Not one specimen of any other marine mammal species was observed. 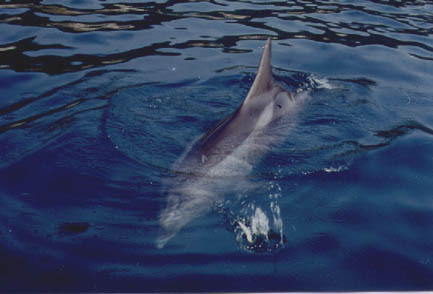 Bearzi, G., C. M. Fortuna, G. Notarbartolo di Sciara (1998): Unusual sighting of a striped dolphin (Stenella coeruleoalba) in the Kvarneric, Northern Adriatic Sea. Nat. Croat. 7, 169-176. Bearzi, G., G. Notarbartolo di Sciara (1995): A comparison of the present occurrence of bottlenose dolphins, Tursiops truncatus, and common dolphins, Delphinus delphis, in the Kvarneric (Northern Adriatic Sea). Annales, series historia naturalis 2, 7, 61-68. Beaubrun, P. C. (1995): Atlas préliminaire de distribution des cétacés de Méditerranée. Commission Internationale pour l'Exploration Scientifique de la mer Méditerranée and Musée Océanographique. Monaco. Birin, I., S. Stefanac (1997): Autokarta Hrvatske, Hrvatska, Slovenija, BiH, 1:500.000. Trsat. Zagreb. Brusina, S. (1889): Sisavci Jadranskog mora. Gradja za faunu Hrvatsku uz obzir na ostale sisavce Sredozemnog mora. Dionicka tiskara. Zagreb. 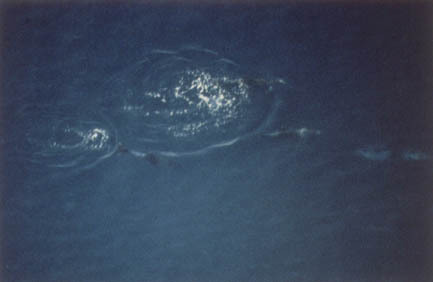 Carretta, J. V., K. A. Forney, J. L. Laake (1998): Abundance of southern California coastal bottlenose dolphins estimated from tandem aerial surveys. Marine Mamm. Sci. 14, 655-675. Cockcroft, V. G., V. M. Peddemors (1990): Seasonal distribution and density of common dolphins Delphinus delphis off the south-east coast of Southern Africa. S. Afr. J. mar. Sci. 9, 371-377. Cockcroft, V. G., J. B. Ross, V. M. Peddemors, D. L. Borchers (1992): Estimates of abundance and undercounting of bottlenose dolphins off northern Natal, South Africa. S. Afr. J. Wildlife Res. 22, 102-109. Fink, N. (1937): Brehm - Kako zive zivotinje. Minerva nakladna knjizara D.D. Zagreb. Forney, K. A., J. Barlow (1998): Seasonal patterns in the abundance and distribution of california cetaceans, 1991-1992. Marine Mamm. Sci. 14, 460-489. FUGAWI (1998): Fugawi Moving Map Software for GPS Receivers, Navigator's Manual. Toronto. Garms, H., L. Borm (1981): Fauna Evrope. Prirucnik za odredivanje. Mladinska knjiga. Ljubljana. Gomercic, H., D. Huber, A. Gomercic, T. Gomercic (1998): Geographical and historical distribution of the cetaceans in Croatian part of the Adriatic Sea. Rapp. Comm. int. Mer Médit. 35 (2), 440-441. Gomercic, H. D. Huber (1989): Istrazivanje i zastita morskih sisavaca Jadrana. In: Cetvrta konferencija o zastiti Jadrana. Plenarni referati i izvodi saopstenja (Grgic, P., Ed.) 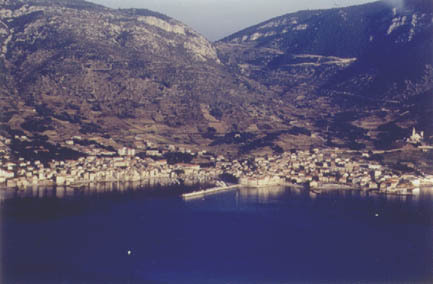 Neum. p. 191. Gomercic, H., D. Huber, T. Gomercic (1994): Dupini Jadranskog mora: danasnje stanje i prijedlog za njihovu zastitu. 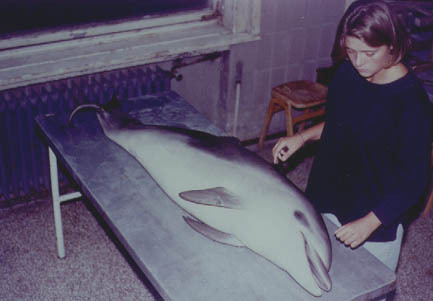 The proposal for dolphin protection by law addressed to Croatian government (4 January 1994). Gomercic, H., D. Huber, T. Gomercic, A. Gomercic, D. Skrtic, S. Vukovic (1994a): The striped dolphin (Stenella caeruleoalba, Meyen 1833) for the first time found in the Adriatic Sea in 1991. In: Proceedings of abstracts of the papers presented at The fifth congress of Croatian Biologists (Gomercic, H., Ed.). Hrvatsko biolosko drustvo. Zagreb. pp. 340-341. Gomercic, H., D. Huber, V. Gomercic, D. Skrtic, A. Gomercic, S. Vukovic (1998): Dolphin morbilliviral infection from the Mediterranean Sea did not spread into the Adriatic Sea. Acta Veterinaria Hungarica 46, 127-134. Grubisic, F. (1990): Ribe, rakovi i skoljke Jadrana. Naprijed. Zagreb. Hirtz, M. (1922): Kit debeloglavac, Globicephala melas (Traill) u vodama Hrvatske. Glasn. Hrv. prirodosl. drustva 34, 84-89. Hirtz, M. (1937): Rijetke vrste delfina u vodama Korcule. Priroda 27, 25-28. Hirtz, M. (1940): Kljunata uljarka (Hyoeroodon ampullatus Forst.) u vodama Jadrana. Priroda 30, 21-24. Jardas, I. (1996): Jadranska ihtiofauna. Skolska knjiga. Zagreb. Kolombatovic, J. (1885): Imenik kraljesnjaka Dalmacije. I. dio: Sisavci i ptice. Godisnje izvjesce c. kr. vel. realke u Splitu za god. 1884-85. Split. Mate, B. R., K. A. Rossbach, S. L. Nieukirk, R. S. Wells, A. B. Irvine, M. D. Scott, A. J. Read (1995): Satellite-monitored movements and dive behavior of a bottlenose dolphin (Tursiops truncatus) in Tampa Bay, Florida. Marine Mamm. Sci. 11, 452-463. Nishiwaki, M. (1972): General biology. In: Mammals of the sea. Biology and medicine (Ridgway, S. H., Ed.). Charles C Thomas. Springfield. pp. 3-204. Notarbartolo di Sciara, G., G. Bearzi (1992): Cetaceans in the Northern Adriatic Sea: past, present, and future. Rapp. Comm. Int. Mer Médit., 33, 302-303. Notarbartolo di Sciara, G., D. Holcer, G. Bearzi (1994): Past and present status of cetaceans in the Northern and Central Adriatic Sea. In: Proceedings of abstracts of the papers presented at The fifth congress of Croatian Biologists (Gomercic, H., Ed.). Hrvatsko biolosko drustvo. Zagreb. pp. 401-402. Riedel, R. (1963): Fauna und Flora der Adria. Verlag Paul Parey. Hamburg und Berlin. Ross, G. J. 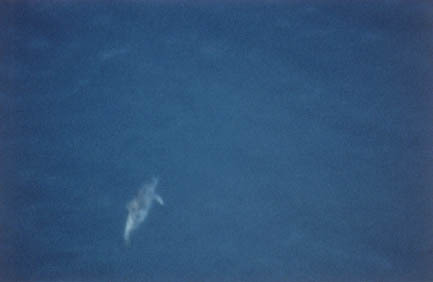 B., V. G. Cockcroft, D. A. Melton, D. S. Butterworth (1989): Population estimates for bottlenose dolphins Tursiops truncatus in Natal and Transkei waters. S. Afr. J. mar. Sci. 8, 119-129. STATE HYDROGRAPHIC INSTITUTE (1996): Jadransko more - istocna obala, Republika Hrvatska, Male karte, Mjerilo 1:100000, Besselov elipsoid - Mercatorova projekcija. Drzavni hidrografski institut. Split. Soljan, T. (1965): Ribe Jadrana (Pisces mari Adriatici). Zavod za izdavanje udzbenika SR Srbije. Beograd. Vetranovic Cavcic, M. (1871): Pjesme - Remeta, Dio I. Zagreb. pp. 20-21. Vrancic, F. (1595): Dictionarivm qvinqve nobilissimarvm Europae lingvarvm, Latinae, Italicae, Germanicae, Dalmatiae, & Vngaricae. Apud Nicolaum Morettum, Venice. Würsig, B., S. K. Lynn, T. A. Jefferson, K. D. Mullin (1998): Behaviour of cetaceans in the northern gulf of Mexico relative to survey ships and aircraft. Aquatic Mammals 24, 41-50. Yoshida, H., K. Shirakihara, H. Kishino, M. Shirakihara (1997): A population size estimate of the finless porpoise, Neophocaena phocaenoides, from aerial sighting surveys in Ariake Sound and Tachibana Bay, Japan. Res. popul. Ecol. 39, 239-247. Yoshida, H., K. Shirakihara, H. Kishino, M. Shirakihara, A. Takemura (1998): Finless porpoise abundance in Omura Bay, Japan: estimation from aerial sighting surveys. J. Wildl. Manage. 62, 286-291.